Tom McCarthy's first novel, Remainder, was published a few years ago to great acclaim. Zadie Smith, a favourite of mine, described it as 'one of the great English novels of the past ten years'. I personally liked it, but also thought that level of praise was a bit over-the-top - it was an interesting novel, but perhaps because I read it well after all the hype pushed it to 'instant classic/future of the novel' status, found it a little underwhelming. So I approached C with a mixture of interest & trepidation - interest to see what this talented young author would do, and trepidation that again I would miss the point of it. 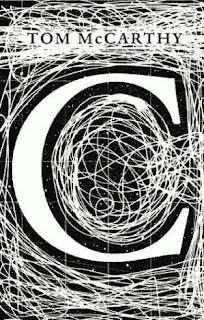 And, to be honest, I found C a bit of a mixed bag. Parts of it bored me & proved to be difficult to really get into, and other parts I thought worked really well. 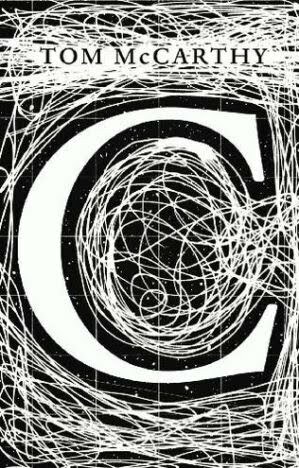 C is the story of Serge Carrefax, born at the turn of the 18th century in England. The first (of four) sections follows his childhood and youth, focusing particularly on his father (a pioneer in radio/telegraph transmissions, and the founder of a school for deaf mutes) and his older sister (a talented scientist herself as a teenager). The second section jumps forward a couple of years from the end of the first, as Serge becomes a radio operator in fighter planes during the first World War. After the war ends, section three is about post-war London, in which Serge is an architecture student who also meets a girl, cultivates his army-initiated drug habit, and investigates a medium claiming to connect people with their sons/brothers who died in the war. As this section ends, Serge is offered a job in Egypt, working on England's attempts to establish a radio network. Next up: Andrea Levy's The Long Song.